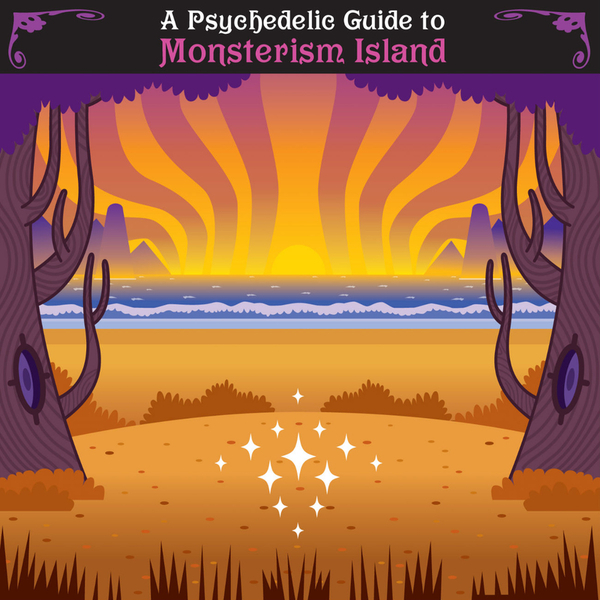 A quick glance at the tracklist reveals quite a line-up of contributors to this new Lo Recordings compilation themed around Welsh artist and graphic designer Pete Fowler's Monsterism Island. Having worked extensively with Super Furry Animals it's no surprise to find Gruff Rhys on the tracklist, but you'll also find works from Jerry Dammers, Jonny Trunk, Luke Vibert, Circulus, Wolf People, Cherrystones and members of The Future Sound Of London, The Ukulele Orchestra Of Great Britain and Beyond The Wizard's Sleeve. The tone of the compilation isn't psychedelic in the way an Acid Mothers Temple album might be considered to be, instead, imagine a Lemon Jelly-scored LittleBigPlanet level and you'll be on the right track. It all adds up very nicely, contrasting electronic outings like Luke Vibert's Cbeebies-styled 'Silver Snorse Hotel' against the Finders Keepers-esque '70s prog-country of 'Mr. Sponge's Groovy Oscillations' by Amorphous Androgynous. The compilation is pieced together with segue tracks featuring scene-setting sound designs and 'monstrous', detuned spoken word sequences, nicely adding to the overall atmosphere of the project.